How many times have you been in search of a replacement bit tip and had to search through the bottom of your toolbag, sifting through the saw dust in order to find one? Unless you get yourself organized, you could waist a good 5 – 10 minutes out of your day. 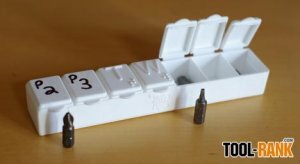 Many of us use a few different types of bit tips throughout the day and one simple way to keep track of what is what, is by using a simple medicine pill box. Pill boxes come in a number of different sizes and can be purchased for almost nothing. With them, you can sort your bits into sections, which will allow you to see when you are getting low. In the example photo, I have used a sharp chisel to remove the raised lettering from the pill box so that I could label them with the bits inside. Now you can toss the pill box into your toolbag or toolbox and always know where your tips are. Each separate compartment for this pill box holds around 8 bits, so you always have enough for quick access. Just try not to get confused and accidentally swallow your #3 Phillips.